The Aegean is one of Turkey's most visited and most developed regions, for good reason: the area is home to some of Turkey's most captivating treasures, from gorgeous white-sand beaches to the ancient ruins of Ephesus. 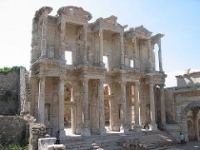 The Roman city of Ephesus is the big draw for sightseers, and rightfully so. Bodrum and its surrounding beach towns attract sun seekers from around the world. Visitors are spoilt with choice when it comes to sightseeing and activities on the Aegean coast with sophisticated hotels, a buzzing nightlife scene, and remarkably unspoiled historic sites. Even Izmir, Turkey's third-largest city and no stranger to concrete sprawl, will surprise travellers with an interesting collection of museums, bustling bazaars, and lively seaside promenades. There are also the fascinating places between these major stops: charming hill towns like Sirince; the otherworldly white cliffs and thermal springs at Pamukkale; the seaside charms of sleepy Gümüslük village, near well-heeled Bodrum; the ancient cities of Priene, Miletus, Didyma, and Laodicea; and the long, sandy beaches at Altinkum and elsewhere along the coast. We are looking for contributors for our Aegean Coast travel guide. If you are a local, a regular traveller to Aegean Coast or a travel professional with time to contribute and answer occasional forum questions, please contact us.